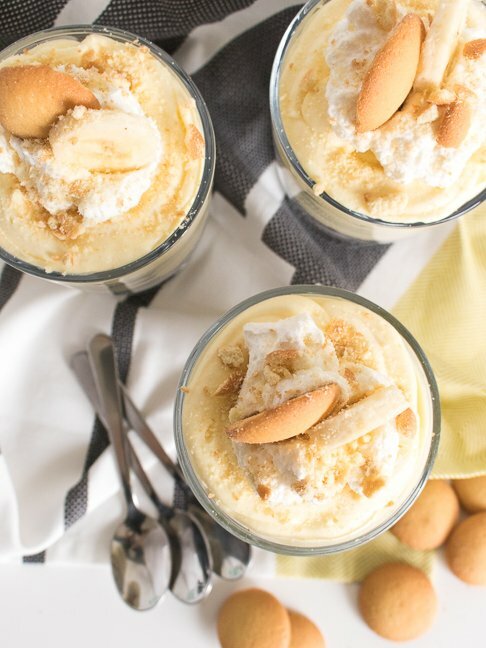 Banana pudding is probably the most delicious dessert in the world. I know, it’s a bold statement but I’m going to stand by it. Even better, it’s ridiculously easy to make. I mean, the hardest part about the recipe is waiting for it to chill before you devour it. 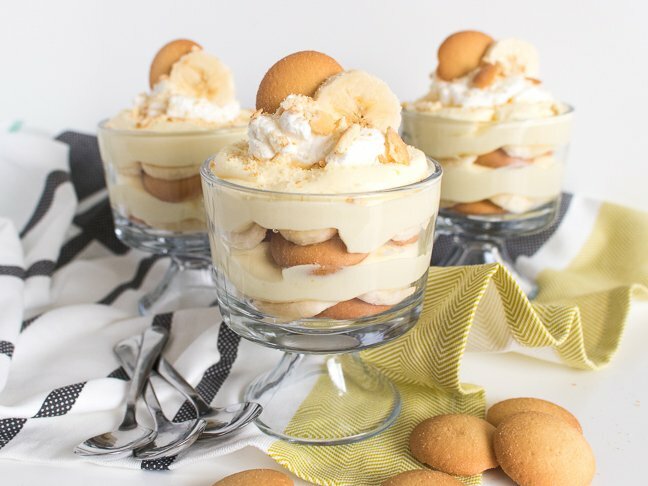 This banana pudding recipe has layers of vanilla wafer cookies, sliced bananas, and thick, creamy, vanilla pudding like a trifle or parfait. Although pudding does take time to set in the fridge, the actual prep time is minimal, making it the perfect recipe for busy folks who still want to put together a special dessert. Although you do use powdered pudding mix as a base for the recipe, the finished dessert tastes completely original, thanks to the addition of condensed milk and whipped cream. It’s so rich and full of vanilla flavor, we’ll bet no one will guess it’s made from a boxed mix. 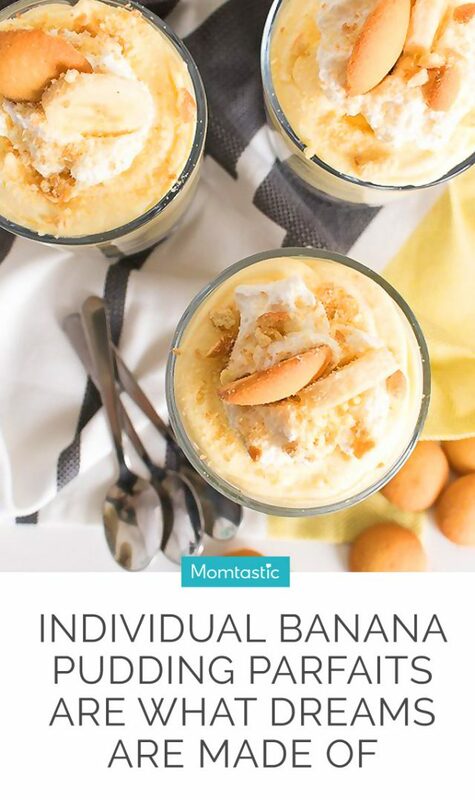 You can make this banana pudding recipe as individual parfaits or as a single trifle to scoop out onto plates. Either way, you’ll get visible layers of pudding, wafer cookies, and bananas. Dig in! Step 1: Mix together the sweetened condensed milk and cold milk in a large mixing bowl until just combined. Add the powdered pudding mix and blend on medium speed for about two minutes until well-incorporated. Step 2: Scrape the pudding mixture into a bowl, and cover with plastic wrap. Refrigerate for at least an hour to allow the pudding to set. Step 3: If using heavy cream to make the whipped cream (which I recommend), whip in a standard mixer on high speed until peaks form. Step 4: Remove the pudding from the fridge. It should be very thick. Fold the whipped cream into the pudding mixture in batches until fully incorporated and smooth. Optional: Save a small amount of whipped cream to use as a topping on each parfait. Step 5: Assemble individual parfaits by placing wafer cookies on the bottom (or assemble a large trifle dish with the same layers). Top with several slices of banana. Then, add a layer of pudding and repeat until full. 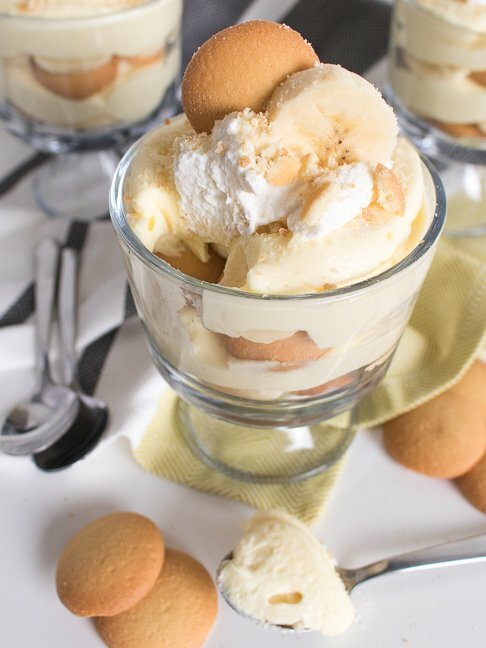 If desired, top with additional whipped cream, wafer cookie crumbs, and banana slices. Note: I use a pastry bag to pipe the pudding into each cup for clean lines, but this is not necessary. Serve immediately or refrigerate for up to two days.